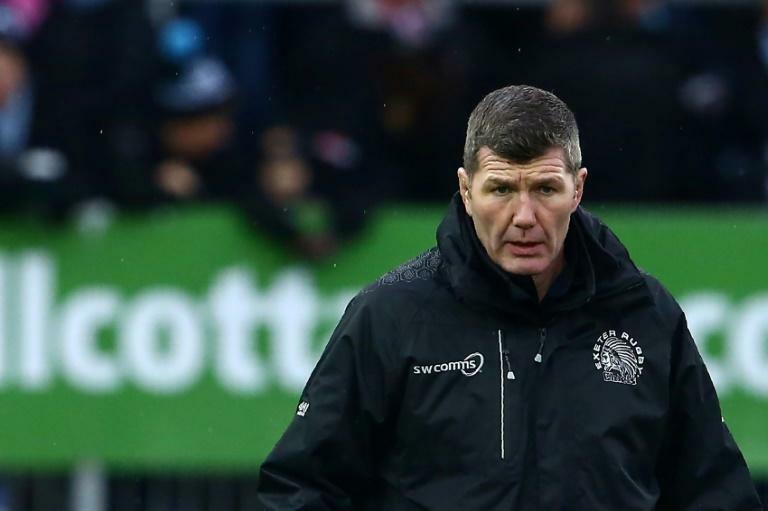 Exeter coach Rob Baxter demanded his side maintain their standards after they booked a place in the Premiership play-offs with five rounds of the regular season remaining. The English title is decided by two semi-finals and a final involving the top four sides in the 12-strong Premiership at the end of a 22-game campaign. Exeter, the 2016/17 champions, lost to Saracens in last season's final at Twickenham and Sunday's result meant the Chiefs were into the knockout stages for the fourth year in a row. But Baxter believes that letting up now would damage Exeter's title hopes. "We are ticking off some milestones but we don't want to splutter through the last five games as we want to build a belief in ourselves and take some belief away from the others," said Baxter. "The squad will have a break now because we are out of Europe and playing two games less than Saracens may help us in the long run." Exeter outscored southwest rivals Bath four tries to one, with Ollie Devoto, Olly Woodburn, Jack Yeandle all crossing in addition to a penalty try. Joe Simmonds converted two of those tries and also kicked a penalty at Exeter's Sandy Park ground. Bath had plenty of possession but all they had to show for it was a try by Nathan Catt and five points from the boot of Wales' Rhys Priestland. Yet Exeter did not have things all their own way, losing first-choice goalkicker Gareth Steenson shortly before the start with a calf injury and falling 3-0 behind when Priestland kicked a penalty following Ruaridh McConnochie's strong run. "Losing Gareth Steenson with a calf twinge in the warm-up disrupted our plans as Joe Simmonds hasn't had of lot game time lately, but we overcame that as Joe played exceptionally well," said Baxter. Simmonds equalised for Exeter with a ninth-minute penalty. Bath, however, regained the lead with a 14-minute try initiated by a break from England centre Jonathan Joseph that took them to within five metres of the Exeter line before Catt, following sustained pressure, went over. Bath full-back Tom Homer was robbed of possession on his own 22, with England wing Jack Nowell and Simmonds involved before Devoto went in for the try. Exeter then went in front for the first time when a pass from impressive back-row Don Armand sent in Yeandle unopposed. Simmonds' conversion gave Exeter a seven-point lead at half-time. Bath made a strong start to the second period only to butcher several good chances before an Exeter penalty try and Woodburn's score five minutes from time put the result beyond doubt. "Two or three tries went begging as we went away from our systems, especially in the red zone," said Bath boss Todd Blackadder. "We created opportunities but didn't execute them, which you have to do against Exeter otherwise you lose."